Over the summer, I’ve tried out a few new salads, here is one of my faves of the moment from Mr Oliver. A great mate introduced me to it last year from his 3o minute meals and I’ve made it about 3 times since. 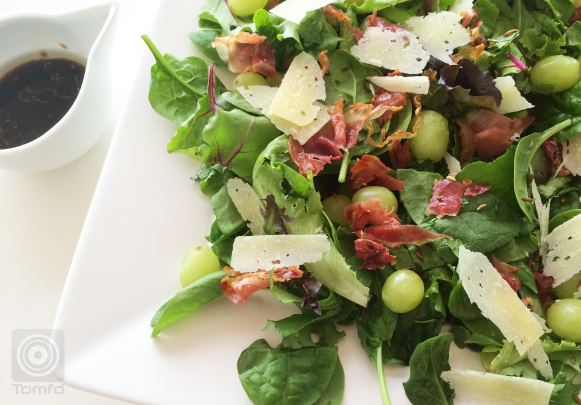 I’m in love with the fennel seeds, prosciutto and the grapes. It’s been a winner at a few bbqs we’ve been to lately, the fennel is not too overpowering, I’ve added cheese ’cause that’s one of my favourite things. Fry the proscuitto in a frypan, with a little splash of oil, turn over once browned and add the fennel seeds. Once cooked remove and let cool then chop or tear into small pieces, (keep all the yummy seeds). Place washed leaves in a serving dish, sprinkle with torn mint and scatter with grapes. Then toss the salad, add prosciutto, fennel seeds and shaved parmesan on top. Dressing: 1/4 cup of olive oil and 2 tablespoons of Balsamic vinegar, add salt and pepper to taste together with the juice of 1/2 lemon. Mix well. I’m trying to eat more salad but it gets a bit boring just eating the same thing, tomato and lettuce with cheese, sometimes that’s all I do. This is a little bit more work but if it makes me eat more greens it’s only got to be good for me. You guessed it… I’m on that get a get fit thing that comes around at my place about this time every year! This one’s made it to the vault at our place. Tried it and loved it…Yumo! Looking to purchase the 2015 Family organiser with 6 column grid to keep track of your busy family? The best pizza dip with cream cheese! Yummy chocolate pizzas… so easy to make My marshterpiece – marshmallow pizza! « How to fold a plastic bag, save space, and go greener!